Islander MC-4-EQ Satin Finish Mahogany Concert Elect/Acous Ukulele from Kanile'a Islander by Kanile'a continues to offer a quality instrument at an affordable price. 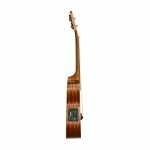 Consider this mahogany concert with beautiful varying color, and figuring, in a traditional style with a natural satin finish. Islanders include a Walnut fingerboard and pin bridge. 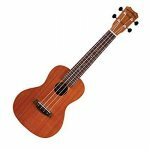 The Islander Mahogany Series Ukulele offers a very bright yet balanced traditional Hawaiian tone that is synonymous with this wonderful instrument. This Concert Model Features a built in electric pickup system with EQ.